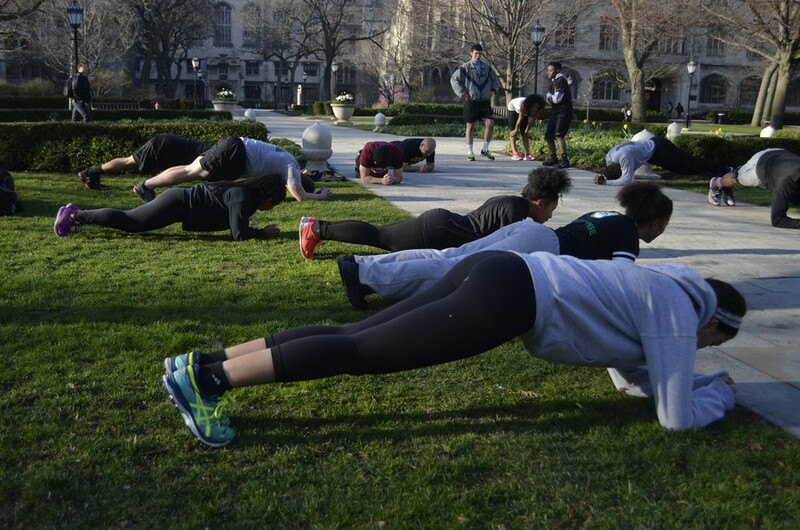 The University of Chicago's branch of ROTC trains bright and early on April 13. After decades of absence from the University of Chicago and a period commuting to classes at other universities, the University of Chicago’s Army Reserve Officers’ Training Corps (ROTC) is reestablishing itself on campus. ROTC is an elective curriculum that prepares students for careers in the armed forces. Some cadets at the University are granted substantial scholarships in return for military service after graduation. In late February, the University’s Committee on Recognized Student Organizations granted ROTC RSO status. The RSO-status determination was made after a long-standing absence of ROTC on campus. The University’s ROTC chapter was closed in 1936. Until recently, the University’s ROTC members were required to commute off-campus to train at the University of Illinois at Chicago (UIC) and the Illinois Institute of Technology (IIT). Beginning in winter quarter of 2015, ROTC began holding weekly physical training sessions at Henry Crown Field House. The organization currently offers physical training and military science classes four times a week. These classes are open to all students in the University, not just to those involved in ROTC. The ROTC’s on-campus general programming is supervised by Major Michael Kesl. “Army ROTC has long been an opportunity off-campus for students who are interested in finding out more about post-graduation service,” Kesl wrote in an e-mail. “Now, we are working to increase student awareness of these opportunities on campus, and support a UChicago ROTC program.” Kesl is also an Assistant Professor of Military Science and oversees the ROTC courses here on campus. ROTC’s RSO application process began in fall 2015. ROTC’s on-campus growth has been aided by the support of the Institute of Politics (IOP) and the Office of the Dean of Students; the group has also worked with other student organizations such as the Maroon Veterans Alliance. The RSO application was sponsored by academic advisor and ROTC liaison Shawn Hawk. “The Institute of Politics has also been incredibly supportive of our efforts, and allows us space to hold classes every week and provides information on relevant speakers,” Kesl wrote in an e-mail. The University’s current ROTC cohort includes third-years Sarah Starr and Garrett Healy and second-years Matthew Ringer and Alexander Portee. Starr, Healy, and Ringer are all contracted cadets and have been granted full-tuition scholarships through the ROTC’s merit-based scholarship program. Portee has not yet been contracted. By contracting, cadets commit to either four years of active duty or eight years in the Army Reserve. Cadets have the option to remain uncontracted throughout their first and second years in the College. Healy joined ROTC during his second year in the college. He believes that every student would benefit from checking out the program, and encouraged students to join the ROTC’s physical training regimen. “I’ve had a great experience. [ROTC] has been one of the most fun parts of my college experience, mainly because it is so different from all the other UChicago activities,” Healy said. The RSO is currently expanding its programming to include a book club, based on the National War College’s Reading List, and a speaker series.